Big Bash League eight (BBL) for the men and the Women’s Big Bash League (WBBL) four, are upon us. Each season the statement is made that this will be the biggest season to date and each year that statement is proven correct. Just as the BBL and WBBL, improve in both quality and popularity so does the undisputed guide for both leagues by author, Daniel Lane. 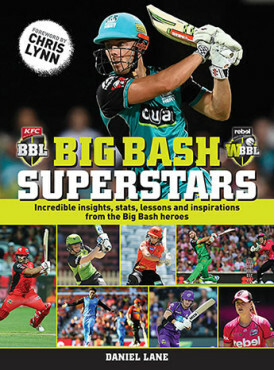 This year, there has been a name change for Lane’s book to Big Bash Superstars (previously Big Bash Book) and also significant differences in the format. Don’t worry though the changes have only improved the final product and Big Bash Superstars will be indispensable to all fans of the Australian domestic 20/20 competition. Big Bash Superstars in set out in two distinct sections. Previously, Lane has started with the BBL and the WBBL is tacked on later. Almost to reflect the rise in the status of the WBBL in the public’s conscience, Big Bash Superstars, sets out each franchise in alphabetical order, combing both the men’s and the Women’s recaps. There is a brief (just a couple of pages) history of all the teams, plus an interview with marquee players on how they thought their team performed last summer. These interviews provide some fascinating insight into the tactics and the edge each team is trying to secure to win the competition. Peter Siddle’s interview is a great example of how a player deals with the pressure of expectation. Apart from a marquee players’ assessment of last summer there is also an “X-factor’, with each club having a ‘game changer’ interviewed for the upcoming season. X-factor players can be up and coming stars or experienced players; for example, Nathan Lyon and Alyssia Healy, who might give an edge to their team. Another new entertaining feature is a short quiz for each team, and thankfully the answers are provided. I did pretty poorly on the quizzes but then again my head is full of 1890s cricketing stats – still I was a little miffed that my 14yo son scored more than me. This year, as the name suggests there is a much greater emphasis on the players. The author seems to have interviewed just about every player of interest. From the superstars such as Meg Lanning, Shane Watson, Ellyse Perry and Glen Maxwell, to the up and comers such as Rashid Khan, Mickey Edwards and Georgia Redmayne; Lane diligently and entertainingly provides short interviews for over 30 players. Just as it predecessors, Big Bash Superstars, has tremendous production values. Full colour glossy printing, easy to use format and loads of pictures, and is a credit to all those involved. There is also an entertaining forward by Chris Lynn, which includes some tips for the budding cricketer. With all that is included the Big Bash Superstars is an essential accoutrement for any domestic 20/20 fan this summer.